evDaily is a simplified version of evPlanIt. Built for those who review Event schedules, but do not need the comprehensive planning and scheduling abilities of evPlanIt. evPlanIt can operate standalone or can share Event information on the evServer with other evPlanIt or evDaily users. Operates on Win2000, WinXP, and Exchange Server. The calendar at the top-left displays a button for each day in the current month that has at least one Event scheduled. The button for the current day is depressed. The table at the bottom displays all Events and Functions for the selected day. 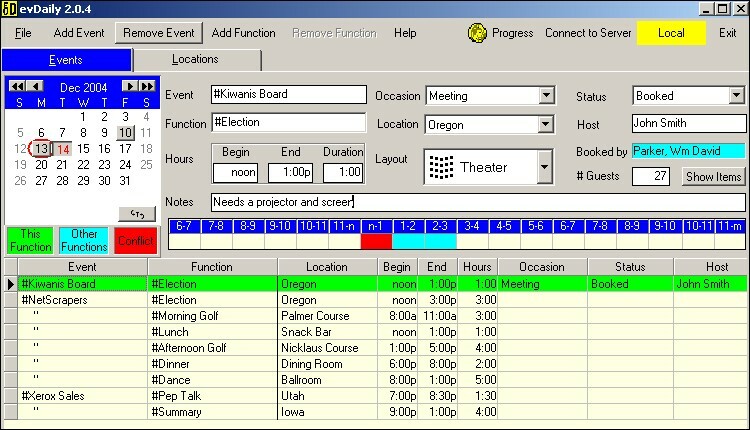 The top-right area displays information about the Event/Function that is active in the table.